To close out 2016, we’re playing a short run on the East Coast of the USA to celebrate in our hometowns and catch cities we missed on earlier tours this year. This marks the end of touring for Jet Plane and Oxbow, so we’re planning to leave it all on the field. It’s been a banner year, full of memorable shows, many thousands of miles driven and flown, and great company. Many thanks to everyone who came to see us or helped us when we were in need &emdash; you know who you are. We’ll be joined once again on this tour by our friends and allies Cross Record, who’ve been blowing minds across the US and Europe all year; Iggy Pop recently shouted them out on his BBC radio show. Here are the dates; you can buy tickets on our shows page. 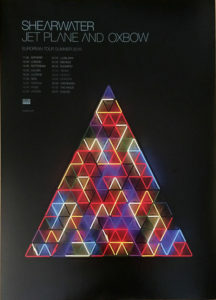 We have a new item for sale on this site: a Jet Plane and Oxbow tour poster. We carried these limited-edition posters to Europe and back on our last tour, but kept forgetting where they were in the van. They’re beautiful, 46cm x 61cm/~18″ x ~24″, and look great in a frame. They’re also signed by me.